We offer traditional sports and we must cherish that. But nowadays youngsters are interested in moving and being active in a different way. For us it was an eye-opener to work with students from Howest, young people with new ideas and different lines of thought. This cooperation helps us to find new ways to develop a policy for the future of sports, sports activities and infrastructure. The new local youth centre Tranzit is located in a former building of the Belgium Railway organisation NMBS. It’s a place where children, teenagers and youth from Kortrijk can meet, be creative and also be physically active. Tranzit offers information and a mix of activities such as urban sports, breakdance and streetdance, hip hop and streetart or graffiti. Youngsters or their parents (waiting to pick them up) are stimulated to move by the interactive wall and floor developed by the Dutch company ICatch Media. The installations respond to the smallest gesture or movement, enabling persons of all ages and abilities to interact and generate immediate, real-time visual experiences. The interactive wall has the element of surprise, users become captivated and enticed to sweep away the first layer of the display to see the information, images or videos on the next layers. 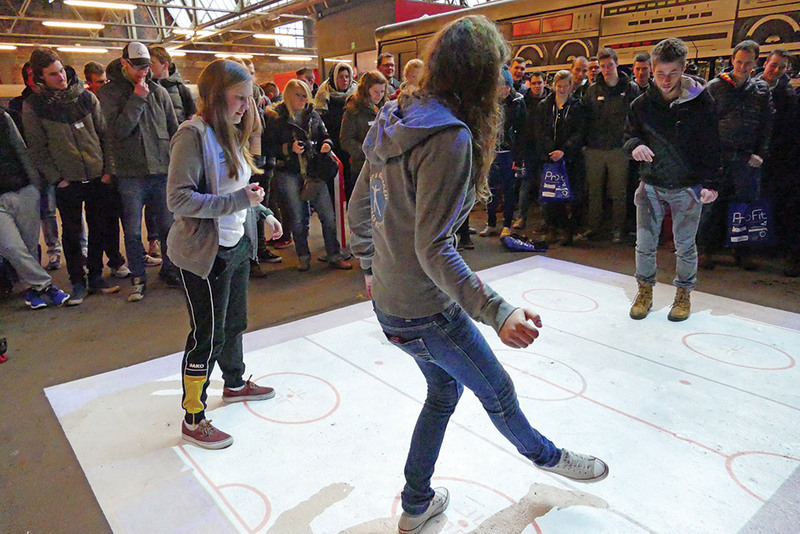 The interactive floor instantly turns into a digital playfield for soccer, tennis or ice hockey. For both the floor and the wall it is possible to use own images, backgrounds, logos or videos to create an unlimited number of customised interactive projections and unique effects.